"He's not a big climber, but prefers ground-based games of chase, wrestling and tickling." 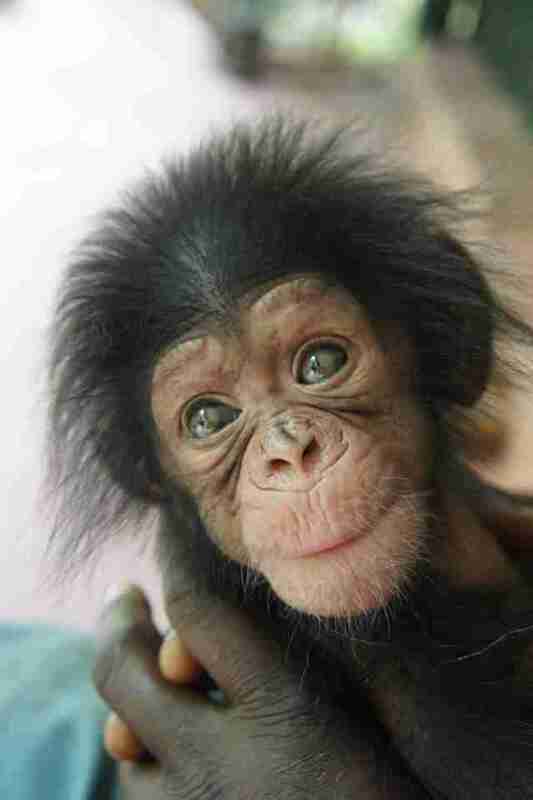 Little Larry the chimp was a big surprise to everyone - perhaps even his own mother. 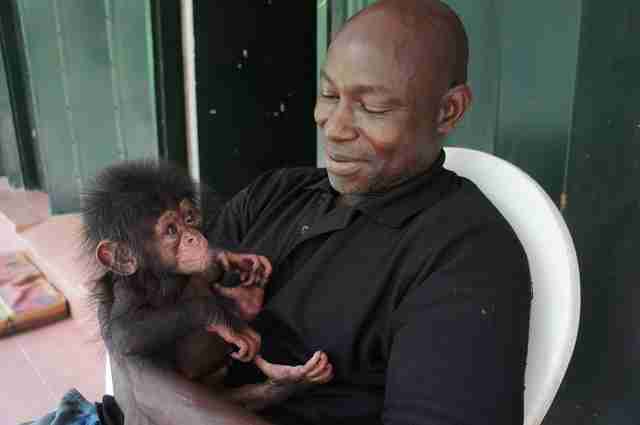 Little Larry's mother Loko has lived at a sanctuary in Cameroon run by Ape Action Africa since 2007, when she lost her own mom to poachers as a baby. 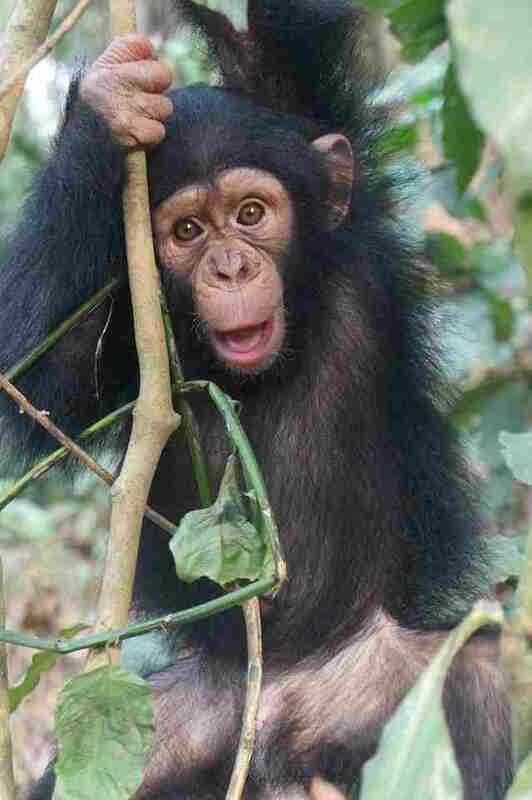 Loko is now 10 years old, and she shares an enclosure with a group of female and male chimps. The sanctuary team puts the females on birth control to prevent any unexpected surprises, but Loko somehow managed to get pregnant - although she kept it a secret until the very end. "It was surprising because Loko didn't show any of the usual signs of pregnancy," Elissa O'Sullivan, spokesperson for Ape Action Africa, told The Dodo. "She didn't gain weight or have an obvious 'bump.' She also likes to spend long periods of time deep inside her group's forested enclosure, so she wasn't able to be observed as easily as some of her group-mates." On the evening of April 12, 2015, Loko refused to join her group inside their cage for the night, preferring to stay inside the forest. This wasn't unusual for Loko, O'Sullivan explained, so the caretakers allowed her to do what she wanted. The next morning, Loko emerged from the forest cradling a tiny infant. Her infant. It was then that the sanctuary team realized Loko had been pregnant. 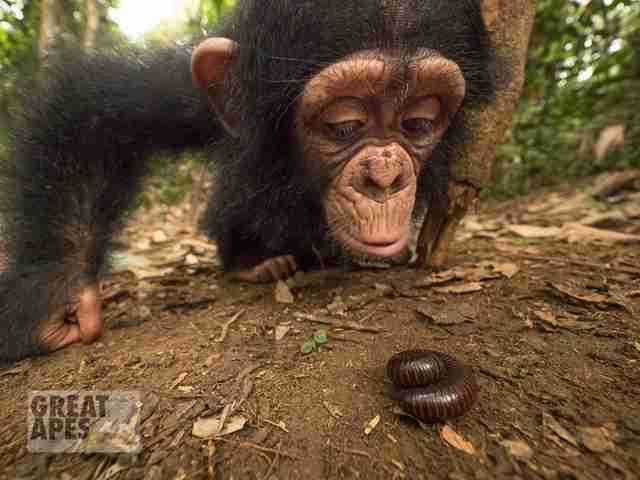 The gestation period for chimps is between 230 to 260 days, so they were astounded that they didn't know. At first, all seemed well for Loko and her baby, whom the sanctuary team named Little Larry. 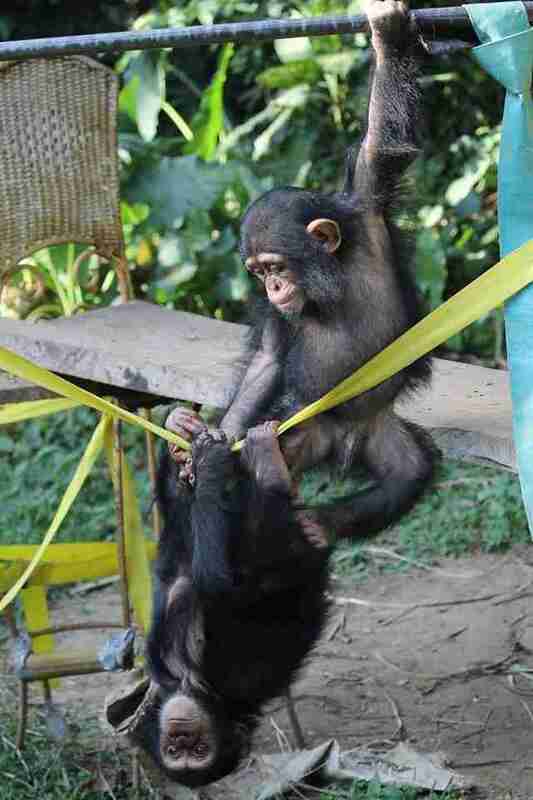 But the other female chimps started to take an interest in the baby- a little too much interest. And unfortunately, since these apes grew up without the natural family structure of the wild, they didn't know how to behave around the new arrival. 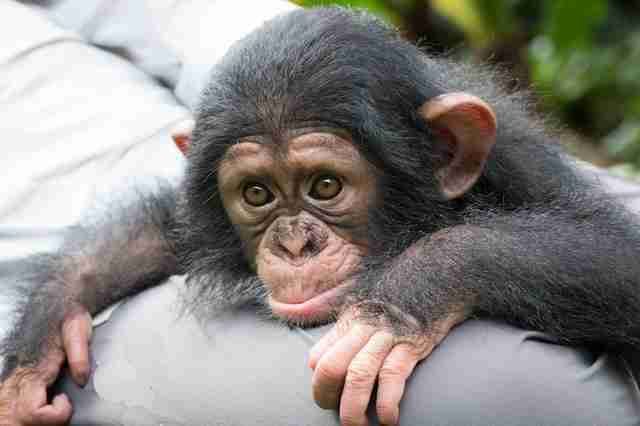 By the next morning, Little Larry was no longer with Loko - he was with another female chimp, named Billie Jean, and both Larry and Billie Jean looked injured. "We'll never know what happened as it occurred inside their enclosure where the forest is very thick," O'Sullivan said. "Births, particularly when they're the first to occur within a group, can create high emotions. This is often more heightened in groups of orphaned primates who haven't had the benefit of observing and learning about raising infants from older females in their natural, wild families." The vet team stepped in quickly. They separated Billie Jean from the others, and sedated her so they could treat her wounds and remove Little Larry from her arms. Little Larry's injuries were pretty serious. "He had deep wounds on the backs of both thighs, consistent with adult canine teeth," O'Sullivan said. "These needed to be cleaned and stitched and antibiotics administered to control infection." Larry also had a broken nose. After getting stitched up, the vet team placed Little Larry in a cage by himself. But he was hungry and missing his mom, and cried out for her. Loko dashed over to his cage and rattled the door. When the team let her inside, she immediately scooped Little Larry up. But instead of feeding him, Loko held her baby away from her breast and started picking out his stitches. Unfortunately, it was clear the vets needed to step in, so they sedated Loko. But when they examined her, they realized she didn't have any milk. "As with human mothers, sometimes breastfeeding doesn't happen in the way we hope or expect," O'Sullivan explained. While it would have been ideal to keep Loko and little Larry together, they knew it was impossible now. If he was going to survive, Larry needed to be bottle-fed. 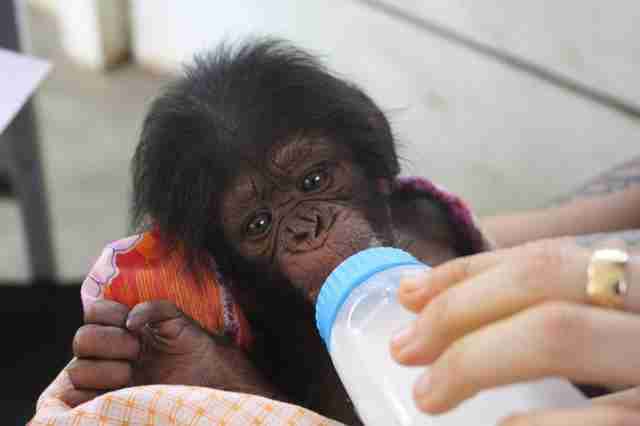 A team of volunteers were happy to take turns mothering the baby chimp. Just like a human baby, Little Larry required a lot of care, especially in the first few months. "He needed 24-hour physical contact with a caregiver and 2 hourly feedings throughout the day and night," O'Sullivan said. "This was provided by our deputy director and two other experienced caregivers, who took it in turns to stay awake caring for him." 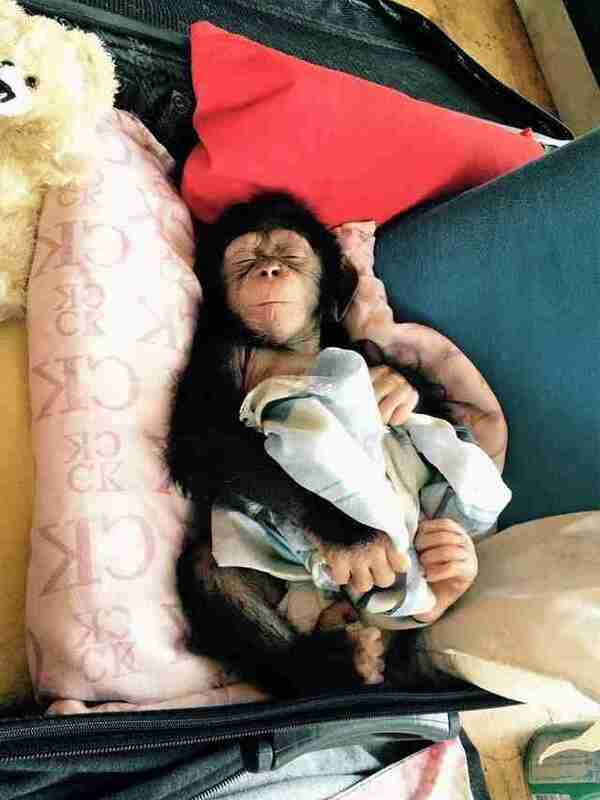 Unsurprisingly, no one seemed to mind caring for this adorable baby. 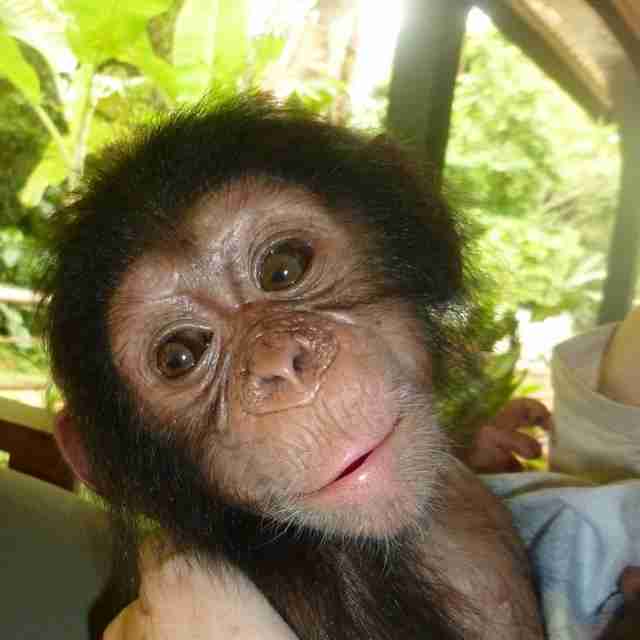 Now one and a half years old, little Larry has gotten bigger and stronger, but he's still very much a baby chimp. 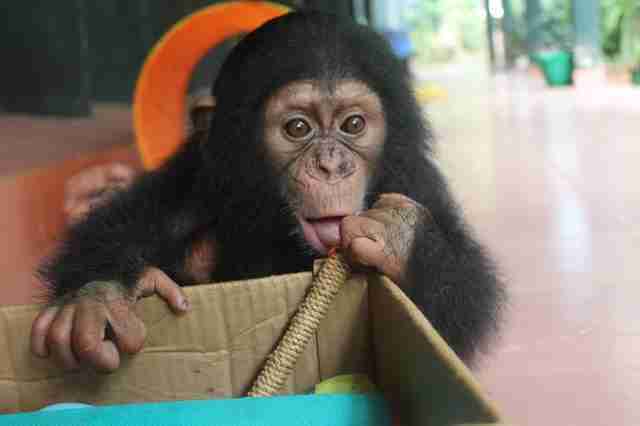 He spends his days playing with three other infant chimps - Daphne, Paula and Jenny. "He's not a big climber, but prefers ground-based games of chase, wrestling and tickling," O'Sullivan said. "He likes to forage for leaves and forest fruits to fill his big belly." While the team hopes to reunite Little Larry with his mom, they have to wait until he's older. "He'd be vulnerable to attack from the mature males in the group who are not always open to accepting infants that don't belong to them," O'Sullivan explained. "He's also now strongly bonded to the three other infants and, if transferred back to his family group, would be the only infant." So for now, Little Larry will live with the other infants in the comfort and security of the sanctuary. And Little Larry couldn't seem happier with this arrangement. 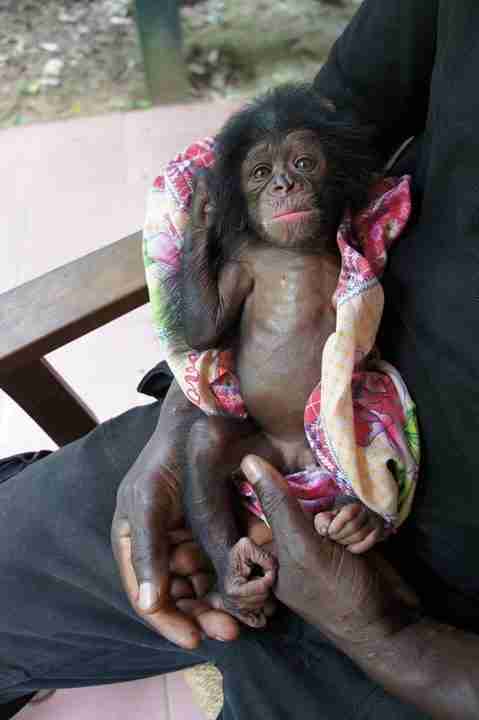 To help support Little Larry, you can make a donation to Ape Action Africa here.